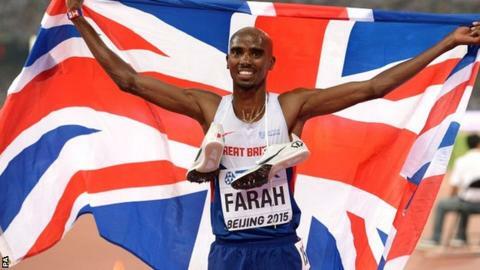 Mo Farah looks set to miss the World Indoor Championships in March to focus on the defence of his Olympic titles. The Briton, 32, says the Glasgow Indoor Grand Prix on 20 February - at which he will race the 3,000m - is likely to be his only indoor race of 2016. The World Indoors take place in Portland, Oregon - where Farah now lives - from 17-20 March. "The 3,000m in Glasgow is likely to be my only indoor race of 2016 and I want to make it a good one," he said. "It will give a good indication of how my training is going and will hopefully set me up for a successful outdoor season." The double Olympic champion, who missed the 2014 Commonwealth Games in Glasgow because of injury, has been based in Portland since joining controversial coach Alberto Salazar's training group at the Nike Oregon Project in early 2011. Farah, who has won seven global long-distance titles, will attempt to retain his 5,000m and 10,000m crowns in Rio in August. The Londoner retained his world titles at the same distances in August and will open his 2016 season in Scotland by racing in the Great Edinburgh International Cross Country on 9 January. He added: "I haven't competed in Glasgow since 2012 and it will be great to be back. The Scottish crowd love athletics and I'm sure they will give great support to the athletes." Farah has not competed at a World or European Indoor Championships since 2012.